One of the series of 6 senses (including the traditional five senses and adding love), today exhibited at the Cluny Museum in Paris. 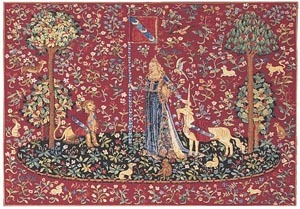 Originally woven in Brussels around 1500 by Willem de Pannemaker. Measures 56" x 80". Fully lined & finished with tapestry rod sleeve. Jacquard woven. Please allow up to 4 - 6 weeks for delivery. No rush service available.